About a month or so ago, I posted on why you should learn to play without pressure rather than building pressure into your game on the practice ground. Yep, you guessed it. The writer said they are worthless because there is no pressure involved. So I wrote a reply which I wish I had saved, because I submitted it but it didn’t get accepted for publication. It’s not hard at all to get published on a golf forum, and we see comments from trolls getting by the censor, but I guess my comment was too incendiary. 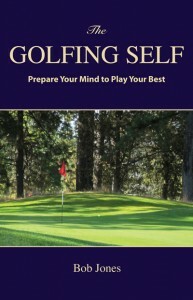 I dared to suggest that controlling the mind is a skill that has nothing to do with golf, but with life, and the reason instructors and touring professionals attempt to find ways to accept pressure rather than eliminate it is they do not know the first thing about how the mind works. I remember Greg Norman saying during his playing days he would never listen to a golf psychologist because none of them knew what it as like to be hitting into the 15th green at Augusta while in contention Sunday, so who were they to tell him what pressure was. He also said upon reflection when his career was over that attitude was a big mistake on his part. So if you have a pro who can teach you how to flush a 5-iron, I would listen. But I would listen at arm’s length when they start telling you about pressure and how the mind works. They’re most likely telling you what is in the air without having ever dipped further into it than that. But I have. So listen up. 1. You are in a situation where you need to perform at your highest level. 2. You have only one chance to get it right. 3. You have judged the price of failure to be high. This list could apply to a five-foot putt. It could apply just as well to a business presentation of importance to your firm. It could apply to rock climbing, where one wrong move could cost you severe injury or your life. To prevent #1 from getting to you, practice to the point that you know what you are doing and have all confidence that you will get it right. Then just do what you’ve practiced. We all know that when we hit that five-footer a second time, after we missed it the first time, it goes in. Why? Because we did not feel pressure!!! So learn to have that second feeling when you hit your first putt. It’s entirely possible. #3 should be easy to deal with. In the grand scheme of life, there are things that can happen to you that are truly costly if you fail, but missing a five-foot putt is not one of them. If the price or chance of failure is to high, then don’t put yourself in that situation. That’s the theory. 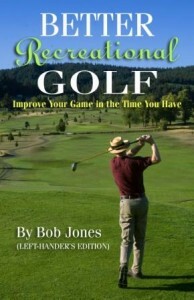 To put it into practice, read my book, The Golfing Self. It teaches you how to develop a mind that is impervious to pressure. 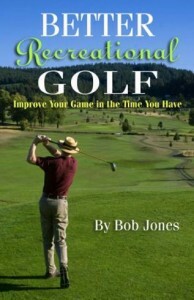 You can listen to professional golfers speak from ignorance and build pressure into your game, or you can develop your mind to play a care-free game of golf and do just as well, probably better. When there is one more hole to go and you can break a milestone score, 90, or 100, or 80, think this way, and ONLY this way. No more, no less. That’s four shots, but it’s just an example. Maybe five shots will do. So play five shots, one at a time. However many, let go of the last shot, focus on the next one, never get ahead of yourself. For each shot, but only one of them at a time, think, “All I need to do . . .” When that shot is over, begin thinking that thought again, and only that thought, for the next one. Be thinking that thought all the way up to the ball for that one shot. Just one. Keep the task manageable. You don’t need to hit four good shots in a row (or five, or six). Just one. You only need to hit one good shot in a row. When you have done that, start again. One good shot in a row. Not getting ahead of yourself. Just this shot. This one. This is not logical thinking, but now is not the time to be logical. Now is the time to make it easy on yourself. You’re cruising and up comes a blow-up hole. The round is trashed. For the rest of the day you can’t get over what happened. The mistake is that you were thinking about how well you have been playing up that point, and getting an inflated opinion of your true ability. You forget that even though your game can get you around the course looking pretty good for a while, it’s not so good that an X can’t pop out every now and then. In golf, you get what you deserve. If you go fairway, green, putt, putt, you deserve that because you’re good enough to have earned it. Sometimes you get into a situation you just aren’t skilled enough to handle, and you deserve the score you get there, too. You have to accept your weaknesses along with your strengths. So, when you write a few pars on your scorecard, don’t think you have become a par golfer all of a sudden. Learn how to write “par” on the scorecard when you get one, and then forget about it. That hole is over. Once you can do that, you can write an X on your scorecard and forget about that, too, and go back to enjoying yourself. This is how I go about swinging a golf club. There might be a something in here that will help you. I take the approach that I am going to swing the club as gracefully and smoothly as I can. I eliminate any desire to hit the ball. The ball is just an object in the way of the swing, and quite honestly, I forget about it while I’m swinging. There’s room for only one thing in your mind at a time, and if it’s the ball, you can’t be feeling your swing. After I have picked my target and feel how I want to swing, I walk up beside the ball and begin setting up. From the time I start walking up to the ball until the finish of my swing, there is a feeling of movement in my mind, and actual movement in my body, both of which never stop. Never let anything, especially the movement in your mind, come to a stop. This is very important. I also eliminate the concept of “distance” from my thinking. The merest hint of “distance” makes you force your swing instead of relying on it. All I want to do is to swing the club. It’s the club’s job, not mine, to take care of where the ball goes. I put my club down behind the ball and line up my stance. I take the club back in a brief waggle and set it down so very slowly behind the ball, so there is still movement. If you watched, you would say I set the club down and stopped moving, but there is still an imperceptible movement going on. At that point, I gently take the club away to begin my swing. I take the club back at a leisurely pace, not slow, but not rushing. The end of the backswing and the start of the downswing is one motion, not two. The crux of the swing is what happens during impact. The setup, backswing, and the first part of the downswing are all designed to put me in a place to swing through the ball with a square clubface, on line to the target, and with as much speed as my swing can generate on its own. Starting the swing down, it is vital that I continue to stay slow, turning in one piece to where momentum can take over. When my swing approaches impact, I feel my hands ahead of the clubhead, pulling the clubhead through the bottom of the swing arc on a straight line toward the target, and keeping the clubhead low to the ground as it continues past the ball, relying on the loft of the club to get the ball in the air. The less physical effort I put into the swing the more accurately I strike the ball and the farther and straighter it goes.